As summer slowly fades into fall we welcome the perfect time of year to be outside. Not too hot, not too cold, the ideal temperature to enjoy time with family and friends. Take a look at our top 10 picks for outdoor seating areas and get a little inspiration to spruce up your own outdoor space! 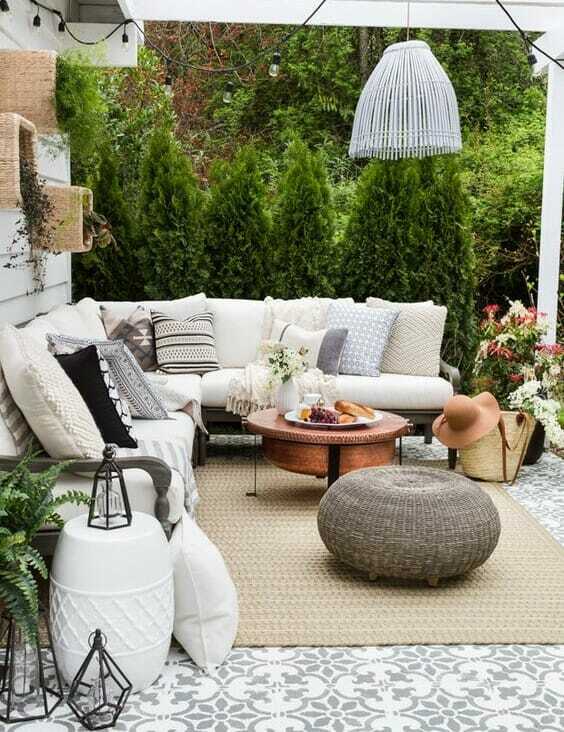 If you need some inspiration for outdoor decor check out our tips for decorating your outdoor space. Pops of color are a great contrast to the beautiful natural landscape. 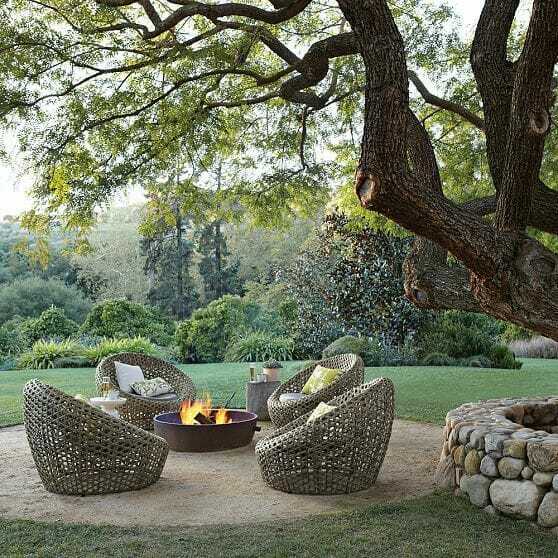 This u-shaped outdoor seating arrangement is great for conversations while warming up by the fire. The use of movable cushions make it easy to accommodate a number of people comfortably. Adding a pergola to your outdoor seating area can really help make the area feel more like a room, and not a deck or patio. Pergolas are a great design feature to give your outdoor seating area the personality it deserves. Lighting can easily be hung, and also adding grasses, fabric, etc. adds a great shade source for those hot summer days. These super fun chairs are a great accent to the simple fire pit. 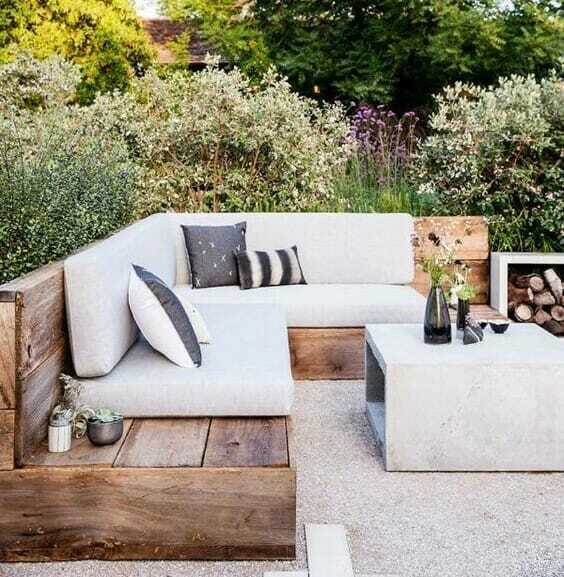 It also looks great to define the space by adding sand or gavel to the landscaping. Having a statement piece like these chairs is sure to wow your guests! 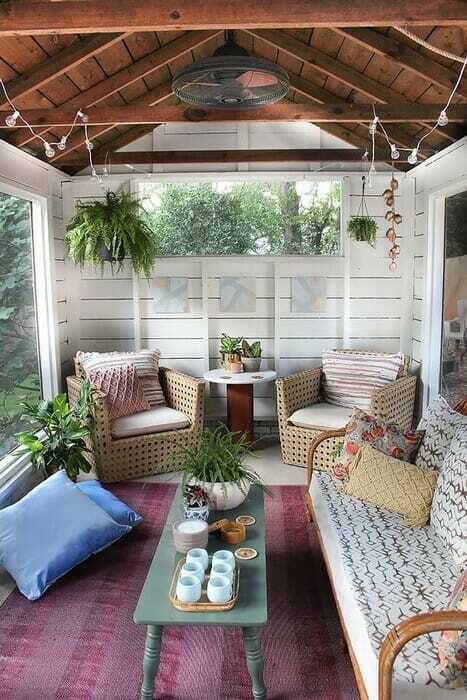 A wood sectional sofa would make a great DIY project for a budget friendly way to create outdoor seating area. The clean simple lines and easily removable cushions make this a very versatile, family friendly design feature that you’ll be proud to show off to your friends and family. Don’t have much space? No problem. By simply adding two accent chairs and a small table you instantly have a perfect area to sit down and kick up your feet. How’s this for inviting? Texture on texture on texture. 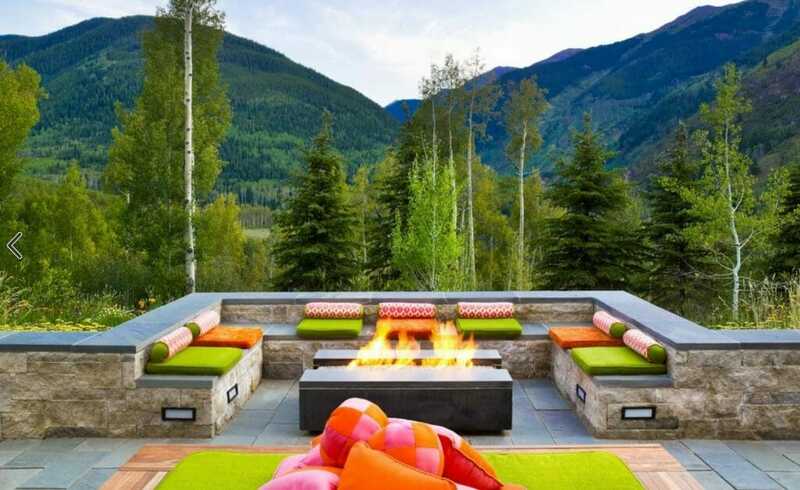 Having a sectional and fire pit combo welcomes idea of spending all day and all night outside. 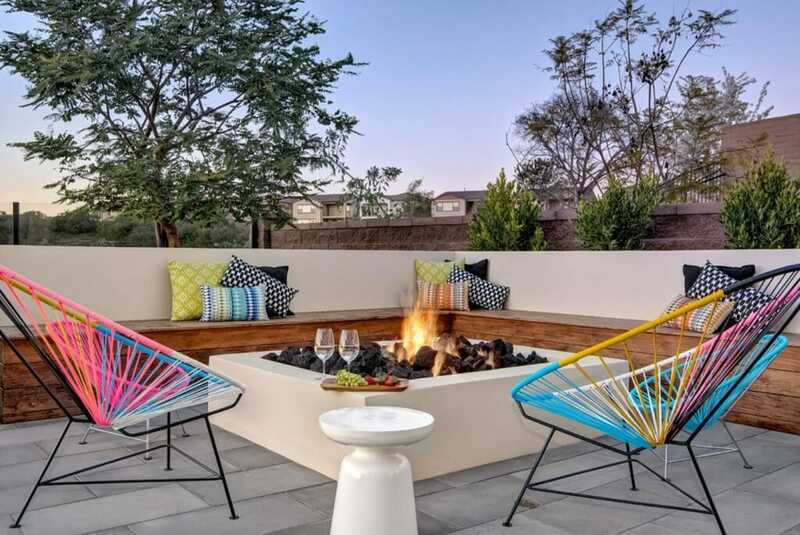 Between the color, texture, and lines in this outdoor seating area you’re immediately welcomed to take a seat and relax. You may as well grab that tasty glass of wine while you’re at it. Design by Decorilla online interior designer, Brittany S.
Who doesn’t love a swing! Practical seating with a fun and funky twist added with these great swing chairs. They’re the perfect addition to any of your outdoor seating areas and sure to be a hit with the whole family. When choosing furniture for your outdoor seating area it can be a bit overwhelming because of all the similar design styles out there. Mix it up with some furniture that isn’t commonly seen. 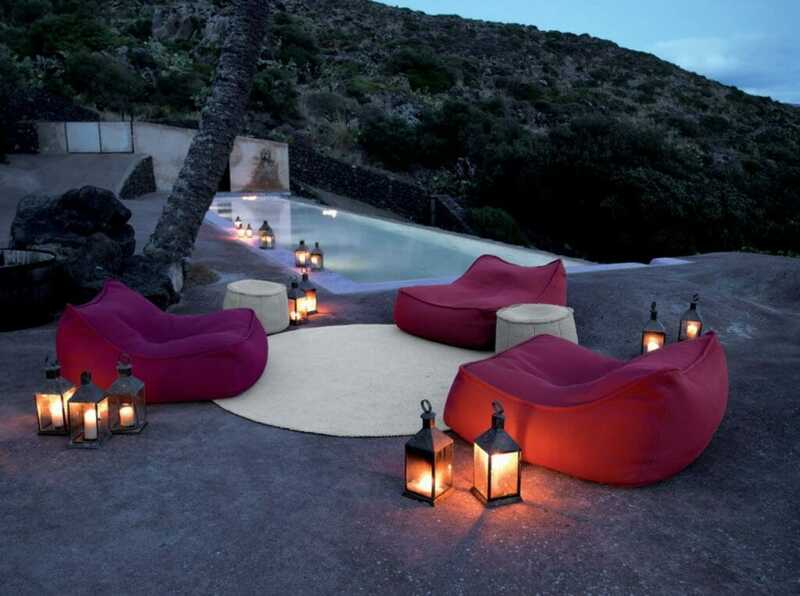 I mean come on, outdoor bean bags?! So much fun for people of all ages! Who knew a bean bag could look so sophisticated. To create a seamless flow from interior to exterior, continue the same design style into your outdoor space. Having the inside and outside of the home reflect the same design style you and your guests won’t even realize when your leaving one space and walking into the other. Adding unexpected items such as table lamps help make this space feel more like a living room, not an outdoor area. Remember to check for indoor/outdoor ratings when buying light fixtures! 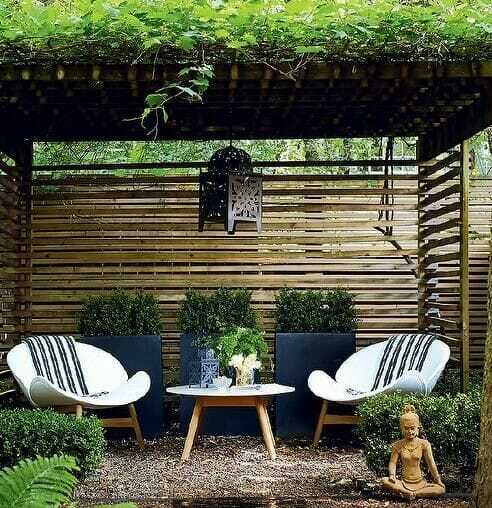 We hope these beautiful outdoor seating areas have inspired you to give your outdoor space the love and attention it deserves! Talk with a Decorilla interior designer today to get your project started.